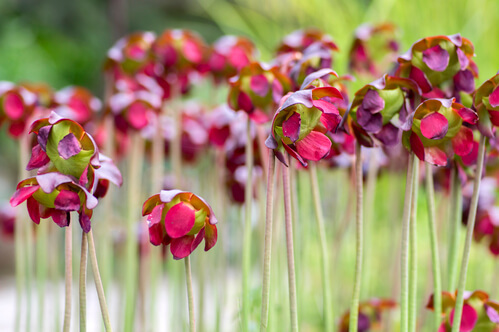 Also referred to as the north pitcher plant, this species can make a great addition to your water garden or pond. The perennial plant has a vibrant color like water lilies, is simple to grow and is easy to find in North America, especially near the coasts of the Atlantic. When mature these plants will develop one flower which is about three inches in length. Watching their growth is a delight. Prior to opening the flower will appear as a ball which is dark colored on top of a stalk which is leafless. When preparing to open the pitcher plant will nod its top downwards, at which point the most dominant colors will be red and purple. The petals and sepals each will curve inward near the center of the flower. At this point the sepals will be the easiest to see, and once the plant blooms it can reach a height of twenty inches. These plants are native to North America, an aside from the Atlantic region they also appear in the central and eastern parts of the continent. This means they are common, readily available and affordable for those who own ponds and water gardens in Canada and the United States. The plant actually occurs in two subspecies, one which is found mostly in Canada, and another which grows heavily near Maryland. This plant spreads through both rhizomes and seeds, producing colonies. When grown around a pond this plant requires complete sunlight. However, it also prefers areas which are wet, and thrives most when it is placed by a water feature’s edge, inside the bog garden or a damp swale. Many pond owners put them in containers with shallow water, with a mat made out of peaty soil and sphagnum moss. The plant will bloom between May and early June, and thus should be handled as specimen plants which are late spring. Their location works best when it is used as a miniature colony and focal point for the pond or garden. Another key thing to remember about the purple pitcher plant is that it is predatory. The reason for this is because the plant evolved in a bog environment which was poor in nutrients. Therefore, the plant has developed the ability to supplement its diet using more than what its roots may pull up. It is also the reason why the leaves appear as pitchers. The pitchers will fill up partially with water from rain, and will emit an odor which will attract insects. Once the insect gets close to the pitcher and lands on or within it they will slide down due to the slick surface, and will unable to escape due to the waxiness of the walls, which make them slippery. Additionally, the walls of the pitcher are covered in hairs which are rigid and also force the insects downwards into the water where they drown, after which their decaying bodies provide nutrients which the plant absorbs. The plant also consumes mosquito larvae and thus the purple pitcher plant can control insects naturally.